Like their civilian counterparts, fire protection specialists in the Air Force are charged with protecting people, property and the environment from fires and disasters. Not only do they conduct fire prevention techniques, but these airmen are also firefighters in every sense of the word, performing rescues and handling hazardous materials. This job is categorized as Air Force Specialty Code (AFSC) 3E7X1. In addition to directing and planning fire protection activities, these airmen analyze fire protection operations for trends and potential problems and devise corrective measures if any issues are discovered. They provide fire protection guidance, coordinate pre-incident plans, and train others on specialized fire protection equipment and procedures. Fire protection specialists also inspect and maintain fire protection vehicles, equipment, and protective clothing, and manage fire alarm communications centers. They inspect Air Force facilities for fire hazards, ensure fire extinguishers are inspected and distributed as needed, and conduct fire prevention awareness and training. In a field or combat environment, these airmen will be called upon to control and extinguish fires, using fire apparatus, specialized tools, and equipment, hoses, and pumps. They establish emergency operations command systems, preserve and protect evidence at emergency scenes and investigate fires after the fact to determine their origin or cause. Aboard an aircraft, fire protection specialists' skills are particularly valuable; they shut down engines safely in the event of a fire, conduct search and rescue operations, and administer emergency first aid. Airmen are eligible for this job if they have a score of at least 38 in the general (G) Air Force Qualification Area of the Armed Services Vocational Aptitude Battery (ASVAB) tests. A secret security clearance from the Department of Defense is required, and this involves a background check of character and finances. If you have a criminal record or a history of drug or alcohol abuse, you may be disqualified from receiving this clearance. Like most Air Force jobs, you must have normal color vision (no colorblindness), and you must be a U.S. citizen to work as a fire prevention specialist. If you have a history of pyrophobia (fear of fire), acrophobia (fear of heights) or claustrophobia, you're not likely to qualify for AFSC 3E7X1. Recruits working toward this Air Force job take the requisite 7.5 weeks of basic training, also known as boot camp, and Airmen's Week. Next, they'll head to Goodfellow Air Force Base in San Angelo, Texas for 68 days of technical training. This includes the basic fire protection specialist course, where airmen gain experience operating firefighting tools and equipment, extinguishing fires, rescuing personnel and performing emergency medical care and CPR. 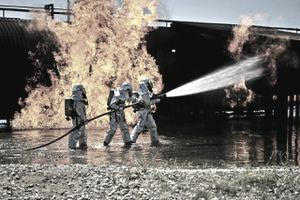 By the end of technical school training, these airmen are trained in Air Force fire department organization, safety requirements and objectives, fire communications and behavior, and how to use portable fire extinguishers in a variety of environments. They know how to enter a fire scene via forcible entry, best practices for ventilating a fire, how to use ropes, ladders, hoses and appliances, and how to control foam fire streams. And perhaps most importantly, fire protection specialists are trained in all aspects of fire rescue, know how to use water supplies and sprinklers and how to handle hazardous materials.